Fellows stay in the Maison Vieilhescaze. There are four roomy bedrooms, one on the ground floor and three upstairs. Each Fellow has their own bedroom. The three upstairs rooms share two bathrooms. The Resident Director will arrange for one group dinner per week and a staff member will take you to the public market and supermarket at Valence d’Agen on Tuesday mornings. Cooking and housekeeping are up to you and your fellow Fellows. Your studio will be next door to the Maison V in La Cebo, a 17th century house transformed into four working studios. What’s in the village of Auvillar? There are currently five restaurants in Auvillar, as well as a pizza truck in Auvillar on Thursday evenings and in Espalais (short walk across the bridge) on Friday evenings. There is a Post Office – La Poste – complete with bank machine which will work with US debit cards and credit cards with PIN numbers. There is also a corner grocery and tabac, a soap store and three art galleries. Much like VCCA in Virginia used to be, internet access is problematic in rural France. We have the highest speed connection currently available, a broadband wireless service, but it’s only 4mb and we all share the same connection. It’s also prone to slowdowns and outages. When it’s working, it works well in both the studio building and the Maison V, but when it’s out it’s out. Please use it the way you would like others to use it, e.g. no peer to peer file sharing, resize photos before uploading, no internet radio, etc. 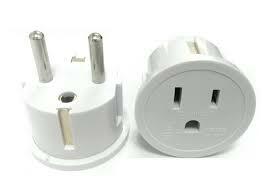 It’s a 220 volt world in France, with European style plugs. 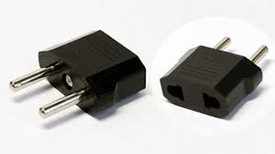 Find adapters like these pictured below for all your electronics. The more expensive transformer/converters aren’t big enough for hair dryers and don’t help with electronics – you don’t need one. These won’t work with high-wattage devices like hair-dryers, curlers, etc, but they work perfectly for all laptops, phones, iPads, etc. There are 220 volt hair dryers in the MV for your use. US$ cash and travelers checks are impossible here. Please bring either euro currency or a debit card with a PIN that you can use at any bank machine. US credit cards will work for many things but not all.